As one of the world?s foremost authorities on all things equestrian, there is perhaps nobody better suited to creating their own line of horse accessories than Mark Todd. Having competed in a number of Olympic events and international tournaments, he is a very well-known horse rider ? and now he has his own range of horse gear. One of the best-selling products from the Mark Todd range are the Mark Todd Riding Boots. All riders need a pair of quality boots, whether they are eventing or simply out for an afternoon ride, a pair of quality riding boots can make a real difference when it comes to enjoyment and practicality. Let?s take a look at a few benefits that Mark Todd Riding Boots can bring. The Mark Todd range is all made of the highest quality materials, and his Riding Boots are no exception. There are a number of types available, but many are made from the very best Italian leather, providing an exceptional fit and comfortable lining. 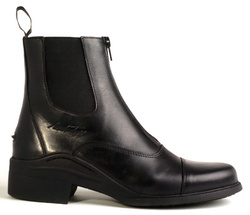 The boots are all designed to fit close to the leg, so riding is always effortless. The sign of a good boot is when you can?t feel them there, and Mark Todd Riding Boots achieve this with ease. Most riding boots are fairly standard, but with Mark Todd Riding Boots, even the least expensive are packed with great features. These include a rubber injected sole for the best protection and support, a full length zip at the back to make the boots easy to put on, and elastic fastening. Throw in the fact that they are all fully water resistant and you?ll see why they?re such a popular choice amongst horse riders of all levels ? from professionals to new starters. If you?re looking for a new set of riding boots and you?ve so far been unable to find the ones that are perfect for you, Mark Todd Riding Boots may be just what you?re looking for. They offer a fantastic blend of build quality and affordability, and they make riding any horse an absolute pleasure. 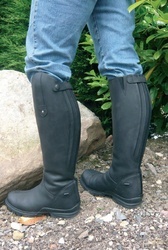 A great pair of riding boots can make all the difference in any horse riding scenario ? whether that be eventing, day to day riding, or anything else. The Mark Todd range is suitable for all weathers and all riding types, so they?re highly recommended. With no compromise on quality, you can always be sure that you?re getting the absolute best value for money when you buy a Mark Todd Riding Boot. No matter what your tastes in colour or materials, there?s sure to be some Mark Todd gear that will suit you and your horse down to the ground. And be sure to have a look at the full Mark Todd range, including everything from Horse Rugs to brushes. Your horse deserves the best, and that?s exactly what Mark Todd provides.